St. Louis, MO area. Sorry, I should have added that to my profile before posting. Maybe other areas are more competitive? I think so...others have indicated they have gotten up ro $2k off + discounts on assessories. They aren’t dealing in my area yet either, so I’m waiting till later in the year. Have you checked out Costco automobile purchasing program? Don’t need to be a member to check out invoice, etc. (just if you plan to use the service). Don’t know if it will help but it would be for fact finding and you’d be under no obligation. I'm not in a hurry, but you're right about being under no obligation. Costco is not a bad idea and I may do that at some point. Like you, I will probably just wait a while to see where things go. This forum, hopefully, will be a bellwether for when prices go down. I think prices will start to significantly drop when the 2018 models are gone. I just checked on Autotrader, and there are still 342 new 2018 RDX's listed within 50 miles of my office in Los Angeles. There are 190 2019 models listed, more than twice as many as were listed a few weeks ago. So inventory is increasing for the 2019 models, but I assume dealers really want to sell the 2018 models right now. A valid point Cruiserchuck. There’s over 300 new 2018 RDX’s within 200 miles of where I am as well. Still lots of old inventory to move. Thanks for sharing. The $500 and $1k off are pretty good in today's market. Has she owned an Acura recently, or did she have to finance through Acura to get the loyalty discount? The solid trade-in is just gravy. Last edited by DWG; 07-01-2018 at 08:47 AM. I just saw a commercial for the 2018 RDX. They are in need of moving them. Quickly. If you like that model, you could probably steal it. Welcome, mostater, I'm in St. Louis as well. I got the same story about MSRP when I test drove at Mungenast, did you go there or Leta? I'm also in wait and see mode on when they are ready to negotiate. I'm hoping they come to their senses by this Fall, but I may end up checking the dealers in Springfield and KC to see if they're taking the same stance. I’m in KC. Pretty much the same thing right now. I think Springfield is now owed by one of the KC dealer. Dealer on Kansas side offered list for all accessories added (1k extra), but then offered 1k loyalty credit (have older TL) and what I wanted for trade. Told him thanks for the time and I will be back when there are incentives. I am also in St. Louis. Given our weather conditions, it will be next to impossible to get any significant discounts on an SUV. The dealers don't have to discount. First, they anticipate high demand and there are only two local Acura dealers. Depending on the amount of the discount it may be worth it to look at other areas and have the car shipped. I went to Leta for the test drive. Thanks for the welcome and for sharing that Mungenast is saying the same thing. I'd be OK buying from an Acura dealer outside the greater St. Louis area. I suspect that they aren't discounting the 2019s much either. I think cruiserchuck has a valid point about the large # of 2018s still available. Those are the ones probably getting discounted. Oddly, the salesman I had at Leta never mentioned anything about the 2018s. Hmm... I wish I would have asked now just to see what level of discounting those were receiving. Neither Mungenast or Leta are showing this on their websites. It seems that you can either get the $1000 as Acura loyalty or via financing through Acura. But you can't "double" dip into the discount. Is that confirmed? If so I may have to rethink how I'm going to pay for mine (finance, grab the $1K, payoff the loan). Hi all! I’m trying to help my aunt to get a good deal on her 2019 RDX Advance. One sale man got back to me with this. Please let me know what you guys think. Thank you! Alright, I just got with my manager. 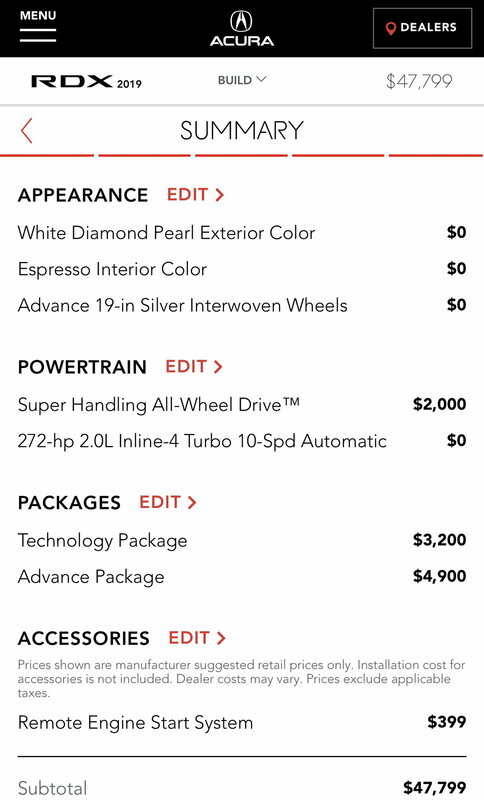 The $47,799 does not include the $995 destination fee added to the cost of the vehicle when it ships from the factory. We would also have to pay another $500 to do a locate on the vehicle you are looking for since we currently do not have an Advance model in. The price for remote start on Acura.com is for buying the part only, with the cost of installation and the part it is about $620. We are willing to eat the charges of the destination fee and dealer locate. We will meet you half way on the remote start and sell the vehicle to you at $47,799. Have to say, I have never heard of a dealer locate fee. You may want to try pricing at a second dealer for comparison. Has anyone tried pricing through the CostCo auto program yet for a 2019 model? The price this dealer has provided is full retail. And the “dealer locate fee”? Seriously? I would try some alternate methods...can’t hurt. Check out Costco Auto Purchasing program. Your Aunt doesn’t have to be a member to do the research. If you give it a try and the dealer contacts you (hopefully with a better offer), a $50 membership might be worth getting for the extra savings. There’s also USAA and there may be others. If you don’t mind my asking...where you at? If you try Costco...let me know how it turns out. I’m holding off for a few months in hopes the dealers get real. New Lease programs (if any) come on out Friday 7/6/18. Will be interesting to see if there is any movement on the MF and Residual #s.
I'd be interested to hear about that Costco program, too. My dealership said they started some sort of partnership with Costco, about which I have no idea. Don't know what that means exactly, and whether the dealership syncing up with the Costco program is better for the dealership or for customers...hopefully, a good deal for all parties. My daughter-in-law used the program a couple of years ago to buy a Honda Fit and saved a couple thousand off the msrp. She liked the program because there was no haggling. You're under no obligation to buy. I'm just not sure if once you start the process, and decide to pass on the initial offer and go into that dealership at a later date to negotiate - if they will take you seriously. There are 11 dealerships within 200 miles of where I live, so if that happened, it would just require a little drive. I've been hoping someone on the forum who has used this service would share their experience, but no one has yet. The vehicle you selected does not currently feature prearranged pricing. However, we are currently working with our local dealer to secure pricing for the 2019 Acura RDX FWD Base. Prearranging low pricing for you is our top priority, and while it could be available soon, we cannot estimate exactly when. If you are still interested in this vehicle or would like to view additional models from this manufacturer, visit our participating dealer for the Costco Auto Program experience. Our specially trained dealers are dedicated to providing superior service and consistent professionalism. Connect me with your participating dealer to receive the great Costco experience. Select a different year, make or model. Visit Car Research to browse other vehicles. I managed to get $1000 Acura loyalty credit and I'm trying to get another $500, but it's a lot harder than I expected. I'm wondering if we should walk or put a deposit on the car we want. if i am loyal acura customer, do you think i can pay about $35000 total out the door for front wheel drive with Tech package ?? i think it is possible with 2018 or 2019 TLX but not sure about this one ? I have some major issues with RDX having poorer MPG than TLX but i was thinking change might be nice ? OTD cost depends on local factors like your sales tax rate, but if you are talking about a 2019 RDX, no. The MSRP is about $41,500. Nostradamus that's funny you chose that screen name as he was a predictor of future events. OTD price not likely even after the cars are sitting on lots. Last edited by Hou-RL; 07-04-2018 at 10:49 AM. You can probably get that on the 2018 model right now with little effort. Might be awhile before they go that low on the 2019. $8000 of a 2018 RDX maybe, but NFW on a 19. That's not going to happen anywhere. No matter how many cars you've bought from the dealership. I was lucky to get the $1K loyalty and a few other things thrown in. No way is any dealership going to give this thing away and lose money on the sale. A 2018 model is probably more reliable, but is nowhere near as nice. There seem to be a lot of 2018 models still out there, but probably not for long. If you can find one you like, you should be able to get a good deal. I had a 17 and I now have a 19. The 17 had a smooth V6, but the 19 is much torquier and pulls much harder. The 19 is like the Starship Enterprise in comparison. Its not even in the same league. I am sure you will get the $8K off a 2018 as I was able to get a great deal for a friend of mine one recently, Hurry before the options become limited. Advance models seem to be thinning out in my area. Going to pick my Aspec up this afternoon. I’ll post all the details of the negotiation when the ink dries, but I will give you a sneak peak. I’m less than list, getting the loyalty credit which we all are, and getting free cargo tray, cargo cover and all weather mats. No destination fees.